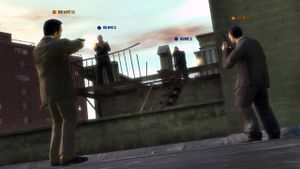 While introduced in the beginning of the series, only certain Grand Theft Auto games have official multiplayer features, and these are often limited in their usage. There have been numerous attempts by teams of fans to create multiplayer gameplay in GTA games, predominantly for those with no multiplayer support to begin with. Some of the modifications created by these teams have been critically acclaimed and have proved very successful. Multiplayer was originally standard in the PC versions of Grand Theft Auto 1, although the process of creating and joining servers requires manual identification of the one's IP address and also those of the playmates. The choices of multiplayer modes in GTA 1 is limited to only two: Cannonball run (a checkpoint race) and the traditional deathmatch. Having been based on GTA 1, the Grand Theft Auto: London 1969 and Grand Theft Auto: London 1961 mission packs employ the same multiplayer mechanisms, but allows the player to play multiplayer games in London, as well as Manchester for GTA London 1961. The processes of creating and joining network games remained unchanged in the PC version of Grand Theft Auto 2, but the game comes with a more user-friendly, Windows-based "GTA2 Manager" to manage and join multiplayer games. GTA 2 features three different multiplayer modes, consisting of the existing deathmatch, as well as "Tag" (players chase one player labeled as "it"; whoever kills "it" becomes "it" in turn, becoming the hunted), and "Points" (where players attempt to rack up as much points or money in the same way they would in single player). FEN_NCI - "NOT CONNECTED TO THE INTERNET"
FEN_PLA - "Number of players:"
FEN_TY3 - "Team Deathmatch stealth"
FEN_TY4 - "Stash the cash"
FEN_TY5 - "Capture the Flag"
A video showing multiplayer menus left in GTA III is also available. The PS2 and Xbox versions of Grand Theft Auto: San Andreas featured a co-op mode, which allowed 2 players to either 'free roam' or go on a 'rampage'. This feature was limited, in that both players had to stay within close proximity of one another. Also, some weapons, like the Sniper Rifle and the Rocket Launcher cannot be used in multiplayer. GTA San Andreas, at one point, in development, was supposed to feature a real multiplayer mode in the PS2 version, but it was dropped for unknown reasons in development. In 2005, Grand Theft Auto: Liberty City Stories was released on the PSP and featured a multiplayer mode for up to 6 players through WiFi ad-hoc mode. A total of 7 modes of play were available. In 2006, Grand Theft Auto: Vice City Stories was released on the PSP with the same functionality as its predecessor, and an additional 3 modes of play available. GTA IV contained the most developed implementation of multiplayer gaming in the GTA series. This has carried over into GTA IV's expansions, The Lost and Damned, and The Ballad of Gay Tony. Grand Theft Auto Online is an online multiplayer universe accessible for free through retail copies of Grand Theft Auto V on the Xbox 360 and PlayStation 3. GTA Online is a dynamic and constantly growing world, as it will continue to expand as content is added either by Rockstar or GTAO players, thus making it larger than GTA V.
Though it mimics GTA V at first and is accessible through that game, Rockstar are treating it as a standalone, separate entity from GTA V, essentially even saying that they feel GTA V has no multiplayer mode because GTA Online is so separate. Multi Theft Auto was the first attempt by a team of fans to implement a multiplayer version of Grand Theft Auto III. It saw its first release February 8, 2003 and quickly gained a large following. Development continued through the releases of GTA Vice City and GTA San Andreas, and is still ongoing today. The current release for GTA III and GTA Vice City is 0.5, while a separate version, 1.1.1R is available for GTA San Andreas. Vice City Multiplayer started development in April 2005, and was used as a codebase for the later SA:MP. The release of GTA San Andreas led to much of the team focusing on that game, however some members continue developing VC:MP. It has so far proved to be quite popular, however SA:MP continues to dominate most of the attention. The current release is v0.3. SA:MP started out as VC:MP (described above) in April 2005. Once GTA San Andreas was released on the PC, most of the team turned to development for the game. It has enjoyed a lot of success during public beta tests, as well as in releases. It has a large variety of game modes, the most of any third party multiplayer mod, and also supports custom game modes. The current version is 0.3c, released by the team on 29th December, 2010. GTA:Tournament started out in April 2003, created by "DracoBlue", who envisioned the use of scriptable servers, support for up to 96 players, and the ability to have thousands of skins and vehicles in the game. It eventually saw releases for Vice City, and later San Andreas. On 29th April 2006, DracoBlue announced that development on the mod would cease. After talks with the SA:MP team, DracoBlue turned to scripting for that mod. IV:MP started out on February, 2010 by JeNkSta, starting out as a simple interface on 0.1a, which was released on April 5th, as 0.1a, which featured a non-working Server browser, and needed to manually insert the server's IP. With 0.1a R5, the server browser was fixed, allowing a much more friendly GUI. Latest release is 0.1 Alpha 2, released on April 9th. GTA IV cops n crooks game mode. GTA Rumble was started in December 2005, and is assumed to no longer be in development; its homepage at gtarumble.co.uk is no longer active. The latest beta release was 0.1c. Its features included chat, spawning, scoreboards, screenshots, weather/time changing, and parachutes, among others. SA-2P, or San Andreas 2 Player, was, as its name implies, a mod to bring the 2 player co-op mode found in the PS2 and Xbox version of GTA San Andreas to the PC, using online play. After having started in June 2005, version 0.1 only ever reached 10% progress according to its creator's website, which was last updated in July 2005. No versions were ever released. SA-2P's homepage used to be at sa-2p .com but no longer exists (see archive), and included a few screenshots and videos of the mod in action, as well as a short FAQ. gtamp.com, an overview and guide on multiplayer in the GTA series. This page was last modified on 18 July 2017, at 21:38.